Naturally sweet. 1 of 5 a day. Green Giant sweetcorn provides you with 1 of your 5 a day. 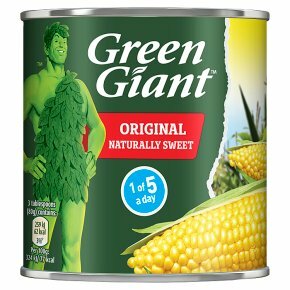 Green Giant sweetcorn is corn on the cob put in a tin in less than 8 hours. Green Giant sweetcorn is made out of 100% natural ingredients. 80g of drained sweet corn = one of your five recommended daily servings of fruit & veg. Empty contents into a dish and cover. Heat for 1-2 minutes.